The walk is based on the original leaflet produced by the late Gordon Mills in 1998 and was first published on this site with his permission in the same year. This walk has become very muddy and can no longer be recommended but for the sake of completeness the text here has been amended to include the addendum changes published in partnership with Marple Local History Society. The walk has not yet been fully updated as part of our longer term programme to ensure that these historic guides remain available for people to enjoy and it is likely that it will need to be extensively rewritten. A better photo of 17 Windows from the Virtual History Tour is used. 1) Our walk starts at the car park adjacent to Rose Hill Station. Follow the Middlewood Way to the left of the Council Depot. Ignore the path to the right shown on the map as this is now overgrown and impassable. Keep to the Way until you pass under the first bridge and take the steps up the bank on the left. At the top turn left and cross the bridge back over the Way. Now continue straight on withthe hedge to your left. 2) After about 300 yards we pass through a gap stile in a fence. Turn right and follow the rather indistinct path as it leads around the edge of the field. After a short distance the path bears left to follow the edge of the wooded valley. We are walking parallel to Stockport Road which is out of sight on the other side of the valley. 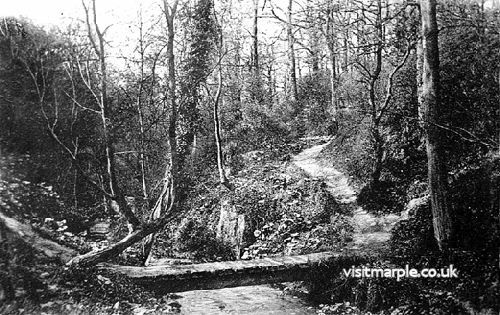 Down in the bottom, although you will be lucky to spot it through the trees, flows Marple Brook on its way to join the Goyt near Otterspool. The path eventually becomes a farm track with a fence to your left. On reaching the farm go through the metal gate and follow the road on the right leading down through the wood. Note: It is the farm track approaching the farm which is the difficult part. The track is several inches deep in very smelly mud. 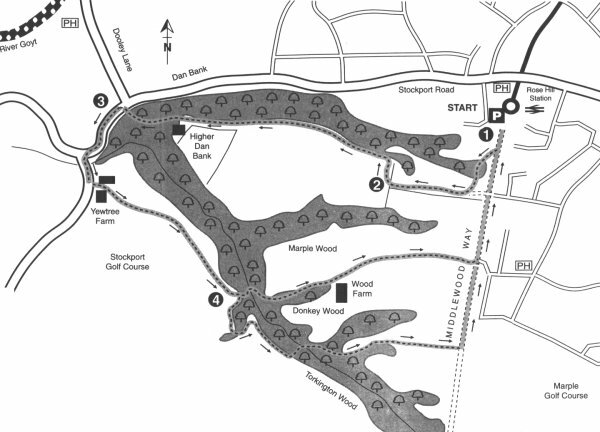 As an alternative it is suggested that you follow Walk 4 (Chadkirk) as far as point 3 and then walk up Dooley Lane to Dan Bank (Point 3 on the current route). 3) The road leads down to the traffic lights at the bottom of Dan Bank. Unfortunately the footpath on the left ends after about 75 yards and so it is necessary to make the rather hazardous crossing of the road and continue up to the next set of traffic lights. The Toll House at Dan Bank. On the way you will notice that some of the old stones that formed the fence shown on the first old photograph above still remain. 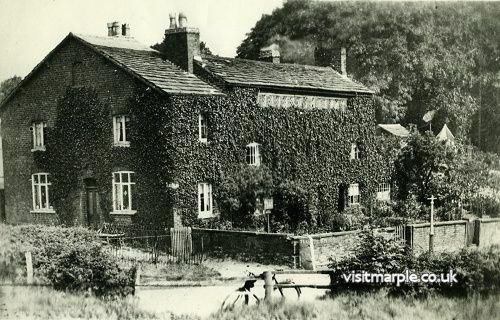 The Toll House used to stand at the bottom of Dan Bank on the corner of Stockport Road and Dooley Lane. It was built by Samuel Oldknow over 200 years ago to help pay for the turnpike roads that he built in the area to distribute the products of his mills. On reaching the traffic lights you will be faced with re-crossing the road and again there is no quarter given to pedestrians. Whilst you are waiting to cross look to the cottage on your right. This is Seventeen Windows, a name that has puzzled many visitors to Marple over the years. The photograph shows how it used to look and the seventeen windows refer to the small windows at the top of the building. This was the workshop for a group weavers who operated here. Incidentally, to save you counting them, there only appear to be sixteen windows so presumably one has been bricked up or covered with ivy. Having crossed the road proceed up Offerton Road in the direction of Hazel Grove. Within a very short distance, turn left into Yew Tree Farm and carry on straight through the farmyard and over a stile to the left of a metal gate. Follow the farm track for about 300 yards and pass through another metal gate. At this stage leave the track and bear left towards the trees. The path is rather indistinct but if you follow the line of the trees for a further 300 yards you will come to a fence with a stile and signpost. 4) Cross the stile and after about 25 yards cross another on the left leading down into the valley. The path is fairly steep but there are steps that finally lead down to Donkey Wood Bridge. Follow the path up on the other side as it climbs slowly up the woods until it finally emerges on a tarmac track at Wood Farm. Don't be misled by the traditional red telephone kiosk and letter box, they are ornaments belonging to the farm. As you turn left look at the roof of the farm buildings straight ahead, you may be lucky to see a number of peacocks (unfortunately they are no longer there). The track makes its way for about 500 yards until it crosses the Middlewood Way. Turn left and follow the Way back to the Car Park. 4a) Cross the stile and continue to follow the edge of the wood. This path is known as the Cown Edge Way. After about 100 yards the path turns left and down to cross a small stream by what could hardly be described as a bridge. The path follows the edge of the wood again with Stockport Golf Course on your right. After about 150 yards we leave the golf course and follow the sign to the left leading down to the stream. Cross the bridge and make your way up the other side and along the clearly defined path. This path can be quite muddy after rain. After passing between the playing fields the path crosses the Middlewood Way. Turn left and follow the Way. After about 200 yards the path opens up to an area where Wood Lane crosses. Continue straight ahead for about 300 yards to return to the car park. There is some controversy as to which of the two bridges that cross the stream is in fact Donkey Wood Bridge. A study of the Ordnance Survey map of the 1890s only marks a foot bridge on the shorter route passing Wood Farm.